1 2 3 Dancers must all live in the same residence. Dancers must be at least 4 years of age. Any allergies or health concerns we should know about? Please note that OHDA membership fees for the 2018-2019 year are due by October 1, 2018. Membership forms and fees must be submitted online. The link to the form is available at www.ohda.ca. Please select the fees associated with the dancer(s) registered above by ticking the appropriate box(es). If you are NOT a current OHDA member: You must tick the "non-member fee" box - the system will NOT automatically do this. If you are registering multiple dancers in the same category: You must manually change the number in the box underneath marked "Quantity". The system will NOT automatically update the quantity if you have multiple dancers in the same category. I hereby for myself, my heirs, executors and administrators, waive and release any and all rights and claims I may have for damages against the Ottawa Highland Dancing Association and against the Ottawa Catholic District School Board, their respective directors, agents and representatives, for any injuries that may be suffered by me or my child(ren) while on the premises during the event. 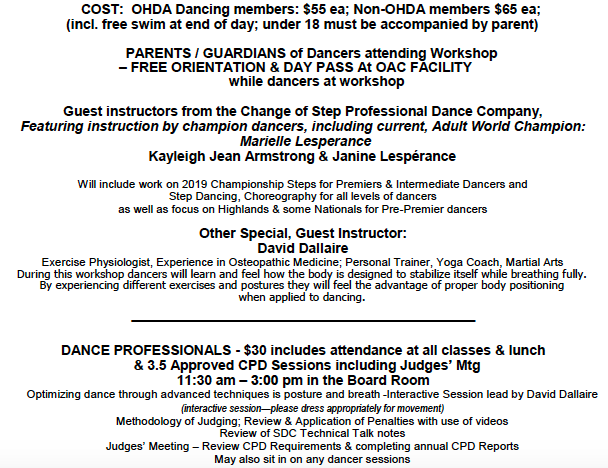 I hereby give my permission for the name and/or photos of the dancer(s) named above to be used by the OHDA on their website, social media sites or other publications. Waiver: The Ottawa Athletic Club and the Ottawa Highland Dancing Association will not be responsible for loss of property or injury no matter how caused. The philosophies and applicable rules of the SOBHD will govern the conduct of all participants. Participants should wear appropriate dance attire, including knee socks, dance slippers (and Jig shoes where required) and a sword if you have one. Hair should be tied back and off face. Please bring water bottle, a nutritious snack and lunch. Bathing suit & towel will be required if swimming.